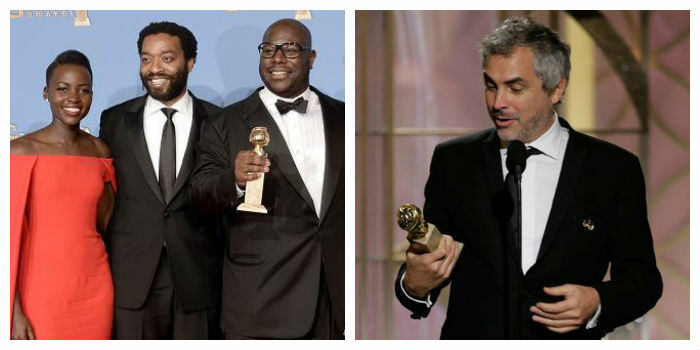 In what seemed like an all around shutout for 12 Years a Slave, the film was awarded Best Motion Picture, Drama at the Golden Globes last night. Chiwetel Ejiofor, Lupita Nyong’o, Michael Fassbender, Hans Zimmer (score), John Ridley (screenwriter) and Steve McQueen were all shut out of their categories and it appeared that there was no love for the film. But in the end it was all good. Alfonso Cuaron became the first Latino director to win Best Director-Motion Picture at the Golden Globes for his film Gravity. And his acceptance speech was pretty funny. What is this about giving Sandra Bullock herpes? One of the big surpriseswa s Andy Samberg winning Best Actor in a TV Series, Comedy for Brooklyn Nine-Nine over Don Cheadle’s performance in House of Lies. Say what? We like Andy Samberg, but Don Cheadle was bar none the best actor on that nominee list. Brooklyn Nine-Nine also won Best Comedy, which was fair. It’s on of the most diverse casts on television with two Latinas and two Black men part of the main cast. Anyway, here the full list of winners (and here’s Tina Fey and Amy Poehler’s monologue in case you missed it).